For the woman who is always there to comfort you, be awake late nights during exams, and be your strength. 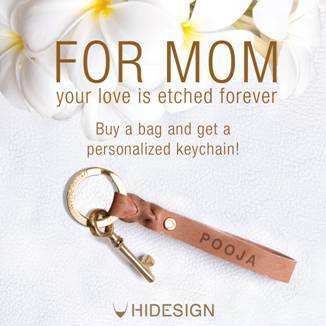 Make this Mother’s day special by picking up her favourite Hidesign handbag or any other bag from our exclusive Mother’s Day collection and get a leather key chain free. Speak your love to her by etching your personal message or her name on to the leather key chain. Pick up a beautifully handcrafted leather bag from our special range this mother’s day. Our gorgeous aubergine and midnight blue colour Angel bags will be great to fit in all her essentials and be her work companion. The stylish yet contemporary Cha Cha bags are an excellent choice for a day out. Step into the nearest Hidesign store or visit www.hidesign.com and surprise her with a stunning bag and key chain. Founded in 1978 by Mr. DilipKapur, Hidesign is a lifestyle group, which re-defined the vision of luxury in India through an ethos of high quality, ecological values and personalized service. Hidesign has established its name through its iconic leather brand based on strong heritage of craftsmanship and innovation. Staying true to its core values, the group has extended its concept of lifestyle by opening two luxury boutique hotels in Pondicherry, Le Dupleix and Promenade. With a global presence, the group has become one of the first Indian brands to be retailed at premium international outlets – John Lewis, Selfridges and House of Fraser in the UK, Myers and David Jones in Australia, Stuttafords in South Africa, Parksons and Robinsons in South East Asia. Hidesign has grown to 84 exclusive stores and a distribution network in 23 countries. In India, the collection is available at all exclusive Hidesign outlets and leading retail stores like Shoppers Stop, Lifestyle, and Centrals.